The next-generation of light-directed picking allows for greater flexibility in operator-based picking strategies. Batch picking, zone picking, and other team-based approaches can be optimized with Pick-to-Light to increase efficiency and accuracy. 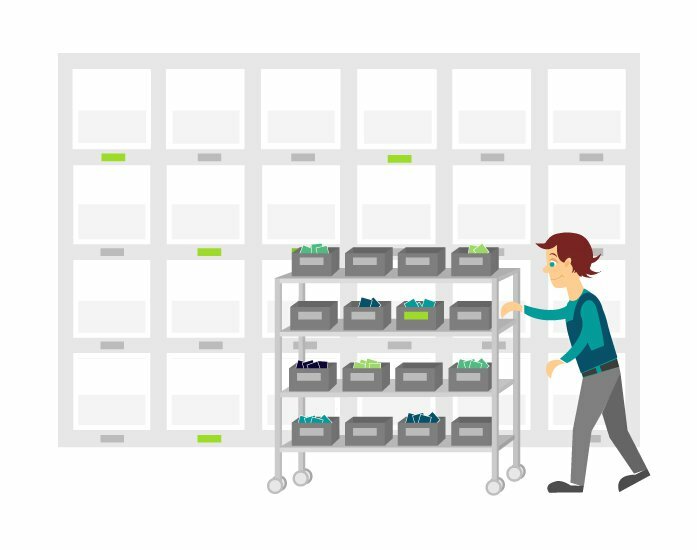 Specifically designed to optimize order fulfillment operations, Pick-to-Light increases pick rate productivity for broken case quantity picking while reducing errors. Pick-to-Light is a light-directed picking and putting system that optimizes broken case and piece picking for e-commerce order fulfillment. Pick to light hardware is installed on shelves and racks or even on picking carts or put-walls. When a new picklist is initiated, typically through a barcode scan or via an Android device, the Pick-to-Light device is illuminated, indicating the number of items to pick. Picks can be acknowledged through a simple button press and depending on the system, the inventory data may be synchronized with a WMS. Pick-to-Light dramatically increases the productivity of e-commerce and omni-channel order fulfillment while reducing errors. The picker starts a picklist (list of inventory items to pick in order to fill one or more orders–typically started with a barcode scan). The pick-to-Light hardware lights up with the quantity to pick. The picker presses the button to acknowledge each pick. The picker repeats the process until the picklist is complete. Alternatively, many warehouses cannot afford to install pick lights on all their racks and choose, instead, to batch pick using picking carts outfitted with pick-to-light hardware. The order picker is directed to a stock location. (Optional) The picker scans a barcode at that location. The picker picks an item from the location. The Put-to-Light device on the cart illuminates to show which tote the item should be placed in. Picking carts optimize batch picking by reducing the pickers total travel distance while increasing his/her accuracy and picking rates. Batch picked orders are often taken to put-walls for order sortation, packing, and shipping. Pick-to-Light is widely known to improve order picking efficiency by increasing picking productivity and accuracy while reducing fulfillment errors and labor costs. Our Pick-to-Light System is more than a picking solution. A simple URL call causes the devices to light up with two lines of custom text. Wireless Pick-to-Light devices can be installed almost anywhere and easily integrate with your current ERP or WMS (or our SKU-Keeper inventory management software). The devices use Turbos or SKU-Stations to connect to the Internet. They are ideal for picking carts, flow-through racks, put walls, and will-call areas. Let’s have a conversation so we can better understand your needs. Call us or schedule a demo so see the next-generation Pick-to-Light solution in action.